Old Redding Connecticut Homes - Which is the oldest and still standing? 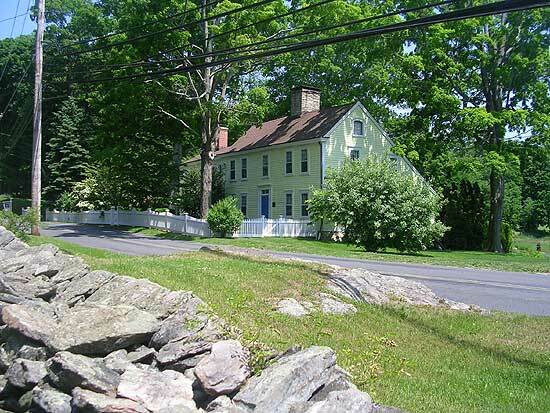 What home in Redding, CT is the oldest, and still-standing? Is a question I am asked quite often. I asked Charley Couch, Redding Town Historian and former president of the Redding Historical Society, for assitance. Below is the information Charley provided. It is a very truthful and honest answer...not to mention very interesting. Thank you Charley! "I don't think anyone really knows which is the oldest house in Redding since not all of the antiques have been checked out. The Aaron Barlow house (on the corner of Umpawaug and Station Rd.) is also very old (at least 1724) and may be older. It may be associated with the Nathan Gold 300 Acre Farm that was established between 1667 and 1687 there at "Umpawaug Neck." The Morehouse Farm was also in this vicinity prior to 1700. Nearby at 657 Redding Rd. is another very old house that I researched and dates to ca. 1727 through John Sanford but it may have been built earlier by the Gold Family. The New Pond Farm house may be from this period too but requires more research. The Capt. Thos. Nash saltbox house at 175 Umpawaug Rd. dates from 1725-26. This is in keeping with the construction style and building orientation seen at the two white saltboxes further down the road near Wayside Lane. One belonged to Ebba Anderson and was totally renovated a few years ago. David Heald's house at 32 Black Rock is an early raised-Cape style and may date prior to 1730. The small 1 1/2-story saltbox on Pine Tree Rd. likely dates from the period too. The "Cradle of Methodism" you alluded to was not built by Aaron Sanford's father, but rather Gurden Marchant Sr. prior to 1750. The house at 60 Cross Highway was once owned by him too and although it was heavily updated in the 1840's and the original two-room layout suggests a very old and primitive structure was the core of it. In the Center of Redding, Larry Ford's house dates from around 1750. Please note: There are even more house mysteries to be discovered but as you can see, trying to say which may be the "oldest" is an elusive matter. Street: 140 Black Rock Tpke. Street: 123 Black Rock Tpke. Do you own or are you looking to own an older home? For many years, the location of this antique was known as "Boston Corners". It was on an Post Road/Stage Coach route which ran from New York to Boston. It was the place where the horses were changed and passengers were fed. The house has been renovated over these years, however an old post road milestone still sits on the west side of the house...which is rare. This tavern had a number of owners which resulted in several name changes for the corner on which it sits: Boston Corners, Pinckney's Corner, and Darling's Corner are the most common. View House History. 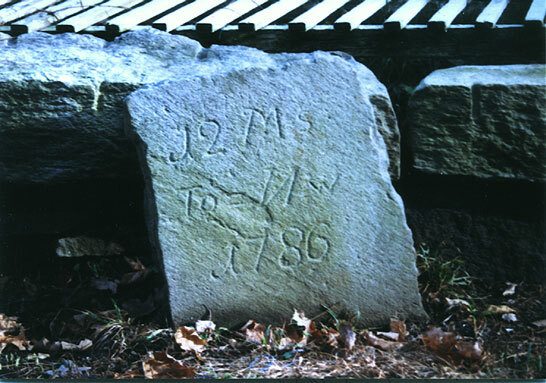 Milestone reads: "12 Ms (miles) To= Nw (Norwalk) 1786" *it was 12 miles to Danbury as well. The main residence is a 1753 landmark colonial offering nine gracious rooms of grand proportion and comfort on 21.58 acres. This four bedroom, 4 1/2 bath residence is in excellent condition and boasts six fireplaces, wide floorboards, rich moldings, exposed beams and classic New England charm galore. The orientation of the home is outside to the exceptional stone patios, extensive gardens, sprawling lawns, pond, gunite pool with screen house and commanding rolling field views of which 15 1/2 acres are preserved in perpetuity by a conservation easement. The outbuildings include a 46 x 28 fully restored barn, an artist studio and separate two-bedroom apartment over the detached garages and a rustic two-bedroom log cabin. Truly an Extraordinary Opportunity! $2,200,000. View slideshow of the Landmark Antique on Cross Highway. Our proud, little town will be 200 years young in 1967. In our 35 square mile area, the backbone of Redding was created. Beginning our tour on the Ridge, heading north on route 58, (Black Roack Road) a weather-beaten salt box, the Bradley Kelly's home, will attract your attention. Its lean-to greenhouse is one of many modernizations. It was constructed about 1735 and believed to have been built by Andrew Burr, who was a petitioner establishing Redding as a recognized town in Connecticut. A mile northward we will pass "The Spinning Wheel" another Burr Homestead, owned by Bradley Burr, who had the mail route by stagecoach from Newtown to Norwalk. 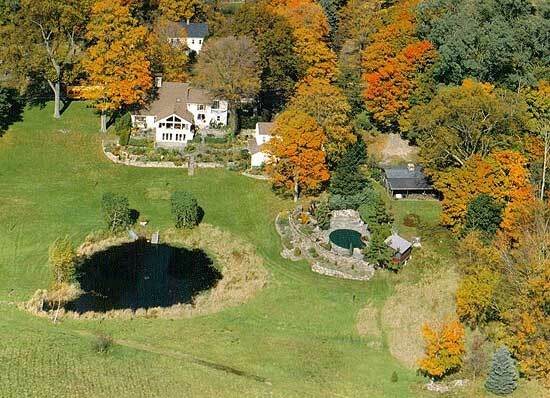 Other generations of Burrs lived here. A part of the original building was destroyed by fire in 1948, but old Bradley Burr's portrait still hangs over the fireplace mantel. Another mile further north will bring you to the "Old Red House", circa 1740, restored and now owned by Miss Madeline McCue. This was the old "Redding Institute" for boys, established in 1847 by Daniel Sanford, later the Redding Ridge Post Office. The Zenke Colonial across the road was also part of the Institute, owned then by Professor Edward J. Shaw, who taught foreign languages and literature. Shaw had the school until 1873, when he became Probate Judge of Redding. He also was the grandfather of our beloved Annie Banks. Opposite Christ Episcopal Church is a weathered, twin-chimneyed Colonial, now owned by the Dysons, circa 1746, and built by Stephen Betts as a tavern for coach stops. During the American Revolution, Captain Betts with William Heron, a neighbor, and General Parsons, who lived there during the troops' stay at Putnam Park, together formed a unique spy ring for General George Washington. This spy ring proved so successful that General Tryon of the British army tried to capture Captain Betts, who escaped by a concelaed staircase to the cellar of his home and on horseback sped through the "Hollow" to Newtown. Later he was captured and imprisoned in New York. Driving west on Cross Highway, there is a large weathered Salt Box built by Hezekiah Sanford for his son, Aaron, circa 1736. This is truly the "museum" of Redding, still unspoiled and furnished with exquisite antiques. It is now owned by Herbert Greenes. Jesse Lee, the Methodist Circuit Rider preached sermons here. Later Bishop amesbury from England helped to establish the first Methodist meeting house in New England here. The first male member to join the Methodist doctrine was Aaron Sanford, who became a staunch leader. In a photostat copy of a document written by Aaron Sanford granting freedom to his two slaves, after he heard the Lord speaking to him advising him to mend his ways. Overlooking the "Green", where the Revolutionary soldiers trained, stands the Ritter house, circa 1736. A wing of this house was the first town market, later removed. A portion of the second floor was used for town meetings, where a hinged partition was swung up ans secured by a huge hook, while a log burning fireplace kept the gatherings warm. On the north side of the "Green", stands the Deacon Thaddeus M. Abbott's home, now the Edmond's place. 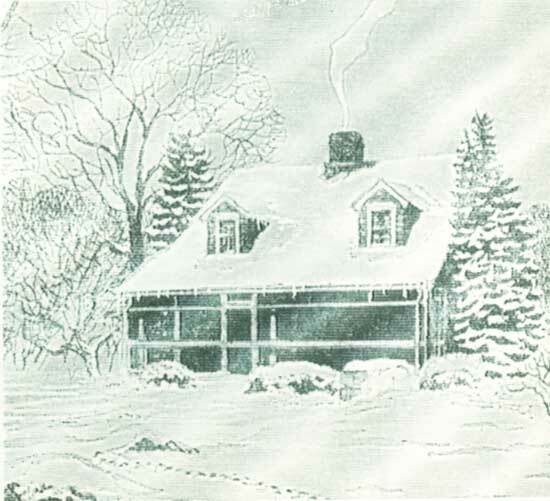 Abbott was a blacksmith and specialized in building sleighs. Deacon Abbott worked diligently for the Congregational Church. North of the old Town Hall is the Will Roland home. It was built by Stephen Burr, uncle of Aaron Burr who fought a duel with Alexander Hamilton. Stephen Burr supervised the laying out of the first road in Redding from Chestnut Ridge and Fairfield town in 1734. Burr also laid the stone foundation of the new Congregational Church in 1732. He had charge of the first parsonage and was instrumental in securing the first parson. Burr had his own grist mill. West of the center "Green", on Cross Highway, is an unusually fine, unspoiled Salt Box owned by Bart Sanford. This house was built by skilled workers hired by Rev. Nathaniel Bartlett, who had purchased the land in 1753 from Lemuel Sanford for 800 pounds. Upon its completion he brought his bride here and became the second pastor of the Congregational Church. Rev. Bartlett secretly stored ammunitions in the attic to protect the town, hoping the British wouldn't discover it. The Aspidorf Salt Box on Diamond Hill Road was the second home built in 1730. It was known as the Boughton homestead, bought in later years and restored by Albert Bigelow Paine, Mark Twain's biographer. Inside there are two columns separation two rooms came from Mark Twain's home, obtained after the Clemens' home "Stormfield" was destroyed by fire. List of Old Homes in Redding and Their Past Owners (Word Document) forwarded by Jean Taylor.